Our boys' work in art, pottery, and woodworking is on display throughout the school as the Winter Art Show showcases the impressive creativity and skill they employed during the first trimester in art. 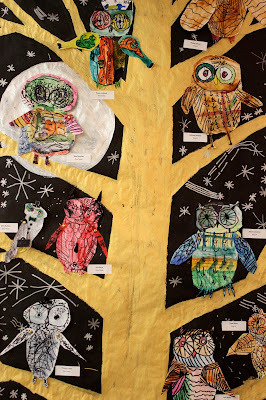 In our art program, boys learn theory and technique; study the work of master artists; visit the nearby Guggenheim, Frick, and Metropolitan Museums for inspiration; and frequently engage in projects that are directly related to their studies in other disciplines. Early on they learn to draw, beginning with shape and line and progressing to the seventh and eighth grade Drawing Boot Camps, in which they use angle finding, eyeball perspective, contour, proportion, and negative space in their observational sketching. As a result of the breadth and depth in the program, our boys develop an informed fluency in art and increased appreciation of the value of looking at life from a variety of perspectives. Stop by the show; it's up through February 12! It will make your day. Earlier this week second graders met with educators from the Metropolitan Museum of Art for a tour of Masks and Faces as it relates to their curriculum. The boys have just begun their winter unit on Masks, inspired by cultures around the world. Ultimately, they will create their own 3D mask made out of recycled materials they have collected, using papier-mâché and paint. At the end of their tour, they were given time to sketch out a work of art at the museum, which they then brought back to class to use as inspiration. 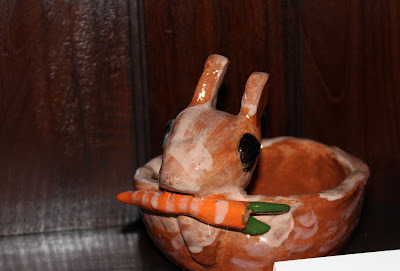 We are so fortunate to be a short walk from many important cultural institutions such as the Met, easily enabling our boys to enhance their learning through collaborations with these outside organizations. Saint David's Winter Festival of Art and Music is underway, and this morning brought us the always wonderful Winter Concert featuring boys in the Chamber Singers, Percussion Ensemble, and Philharmonic Ensemble. The Chamber Singers, directed by Phyllis Clark, sang Three Gifts to Three Kings from Amahl and the Night Visitors, and Seid uns nun Zweitenmal gekommen from The Magic Flute. They were followed by the Percussion Ensemble, led by John Francis, who performed Funky Zena and This Too Shall Pass, in which the Chamber Singers participated. Last up was the Philharmonic Ensemble, with Phil Hough conducting the boys as they played March of the Meistersingers and Variations upon the Sailor's Hornpipe. For the last number, Mr. Hough had all of us join in the fun, we clapped to the beat as the Ensemble played the refrain in increasingly fast tempos. Kudos to all the boys who performed this morning, and to Music Chair Jeff Moore, and our talented and dedicated directors Mrs. Clark, Mr. Francis, and Mr. Hough. It was a wonderful start to the school day. 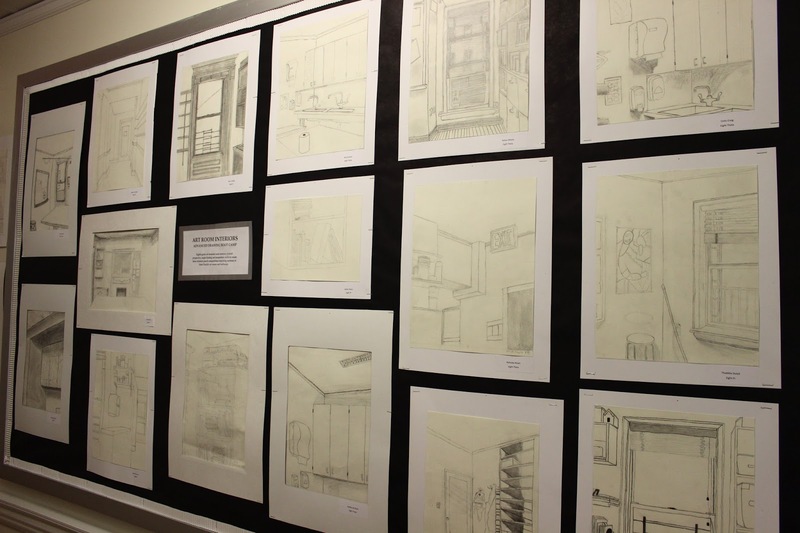 The Winter Festival of Art and Music celebrates the arts at Saint David's, an important pillar in the balanced education that lies at the heart of our school. 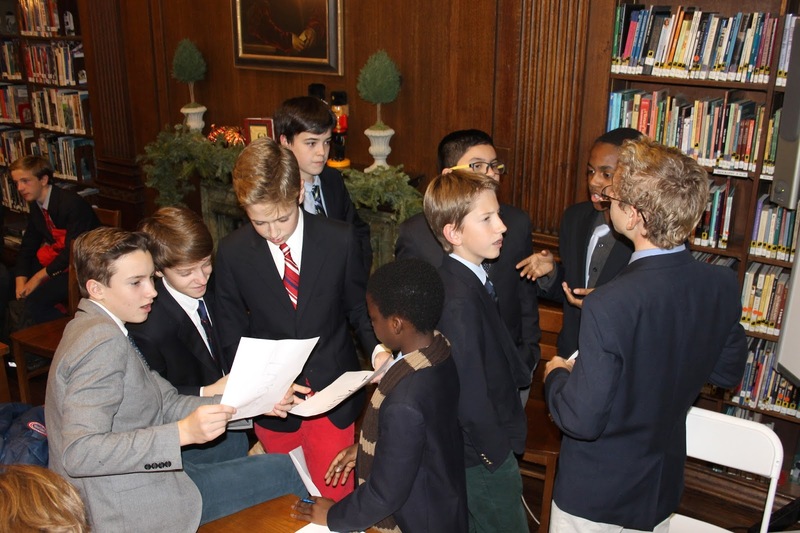 Last week we held special Headmaster Chapels for Grades Three through Eight in honor of Dr. Martin Luther King, Jr. I began by talking with the boys about the legacy of Dr. King: his use of words and ideas rather than force to effect positive change, and the remarkable moral courage he displayed in choosing to do what was right even though he knew it would put his very life at risk. In each Chapel one of our boys read in its entirety "I Have a Dream," the address Dr. King gave on the steps of the Lincoln Memorial during the March on Washington in 1963. 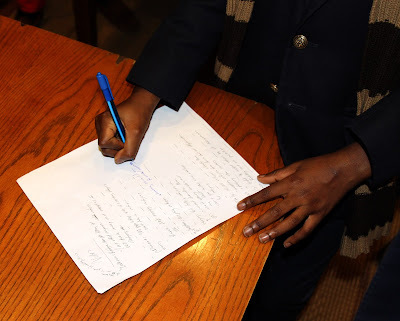 We connected the themes in the speech of equality for African Americans, indeed for all Americans, to the principles the United States was founded upon and which are set forth in its Constitution. The Chapel concluded with our staff member Will Best's moving rendition of Take My Hand, Precious Lord, the gospel song that was Dr. King's favorite. All joined in for the final verse. Martin Luther King's example is particularly relevant this year at Saint David's as the school examines what it means to have the courage to be morally introspective in service of the truth. On several Tuesdays each month during the year, two groups of sixth grade volunteers and I walk 12 blocks north to spend the late afternoon/early evening visiting residents of the Terence Cardinal Cooke Health Care Center. The boys are members of the all-volunteer "Headmaster's Community Club." They elect to spend their free time after the school day ends interacting with elderly residents, many of whom are facing a variety of challenges. The boys engage in one-on-one conversation with residents and participate in craft projects, games, and other holiday themed celebrations. This year 33 boys have volunteered, so many, they make their visits in two separate groups. Parent volunteers often join us as well. I am always deeply impressed by the number of boys who willingly give of their free time and the enthusiastic spirit they bring to their visits. It is heartwarming to watch the boys grow emotionally as they deepen their connections to the residents with each successive visit. These visits are important to me; they reinforce the motto of our mission "that they be good men" and this year's theme: deliberate moral introspection. To look inward in search of truth and goodness is to recognize that we must act outward in service and good will to others. 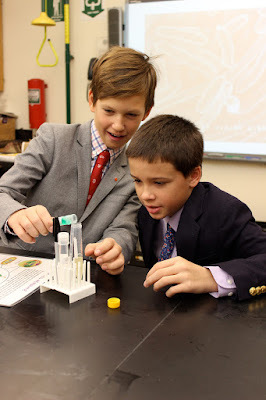 This morning Mrs. McBrien of the DNALC of Cold Spring Harbor led our fifth graders in a lab on DNA extraction, building upon what the boys have already learned with their teachers about the form and structure of DNA. She began with an overview of the discovery of DNA and a discussion about DNA's function as a "blueprint" for traits and functions. Mrs. McBrien then guided the boys in a DNA extraction lab in which they used soap and ethanol to separate DNA from harmless laboratory grade ecoli bacteria. The boys used a plastic loop to lift the DNA, which was floating in the ethanol layer, from their test tubes. They were thrilled to be able to actually see the DNA, something heretofore invisible. This is the third year of our collaborative partnership with the DNALC, which works with our boys in Grades Five and Eight on exciting, hands-on projects that provide the boys an opportunity to learn directly from top scientists in the DNA field as a part of their science curriculum. This multi-week collaboration extends to the DNALC labs at Cold Spring Harbor and includes multiple sessions with their scientists and our Saint David's teachers. 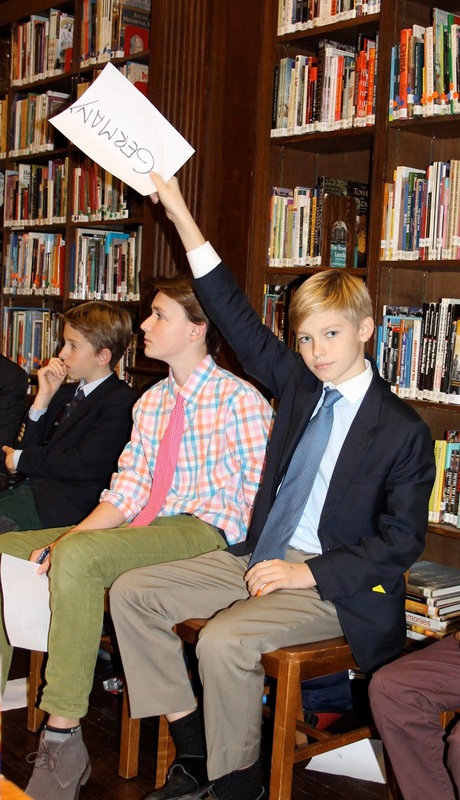 Recently, seventh and eighth grade members of Saint David’s Model UN Club organized an energetic debate about the Syrian refugee crisis. Transformed into delegates of Lebanon, Turkey, Greece, Germany, Russia, the United States and several other countries, club members spent several weeks researching the humanitarian crisis, geopolitical aspects, public perception, and logistical factors involved. To accurately represent each country, delegates had to research diverse viewpoints and practice seeing the conflict through the eyes of others. Early in the fall trimester, students had been challenged to think of a topic that was worthy of international debate and problem solving. After students presented a variety of ideas, the Syrian refugee crisis was selected because of its ongoing urgency and international scope. 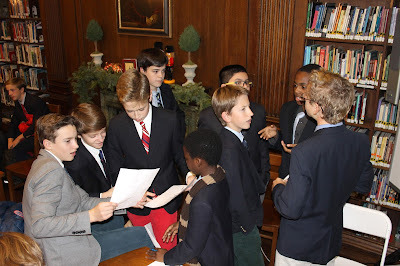 In the process of preparation and debate, boys recognized that the problem had no easy solution, but came away with the understanding that coordinated international effort, funding, and respect for the human rights and dignity of refugees would be necessary to any solution proposed by real-life world leaders. With Deliberate Moral Introspection the theme for this school-year, our teachers are focusing on cultivating the intellectual virtues that underpin it. The Model UN Club, co-chaired by Upper School Librarian Gwen Kaplan and Sixth Grade Teacher Joe Shapiro, provides a great opportunity to do so. 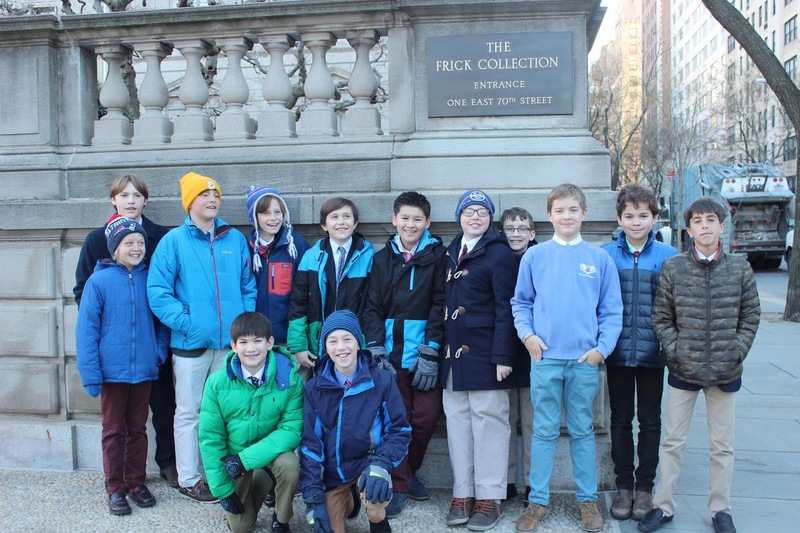 When the boys in Model UN assume and argue the perspective of different countries, they hone empathy, fair mindedness and good listening skills--all critical to developing the ability to truly think and seek the truth. and at Hotchkiss the large Saint David's contingent made up of: Aidan '12, Peter '13, Gardner '14, Will '15, James '15, and Oliver '15 ... were just fantastic! Earlier this week, sixth graders and their art teacher Hannah Frassinelli visited the nearby Frick Collection for a guided tour of some of the Collection's masterpieces in portraiture. 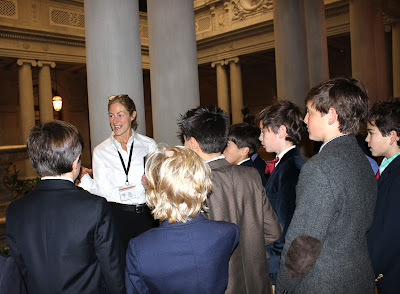 Museum docent and Saint David's parent Olivia Birkelund Gerard expertly led the discussion at each painting, encouraging the boys to make thoughtful observations about symbolism, use of props, background, expression, and overall composition as they took in master works that included a self portrait of Rembrandt, Holbein's portraits of Sir Thomas More and Thomas Cromwell, and Bellini's St. Francis in the Desert. The boys were eager to express their observations, whether about the intensity of the eyes and naturalness of the Rembrandt, the rich colors of the St. Thomas More, or the biblical allusions in St. Francis. 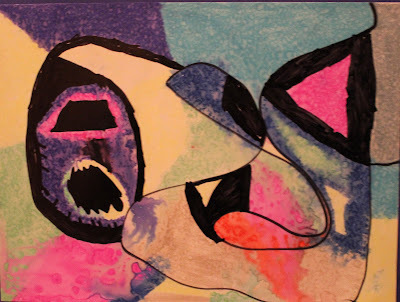 Most impressive were the inferences the boys made about the possible intent of the artist, or the emotional state of the subject, all based on what they observed. 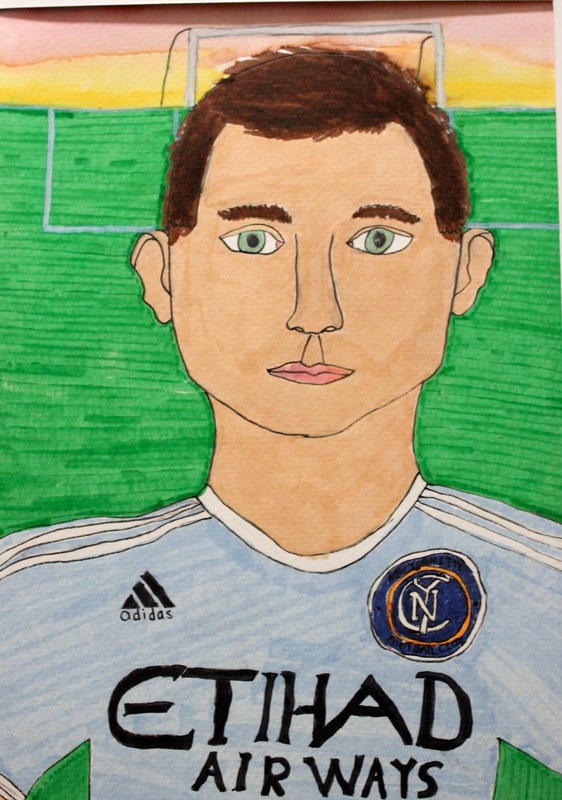 Our boys will consider what they learned when they create their own "aspirational portraits" in class. 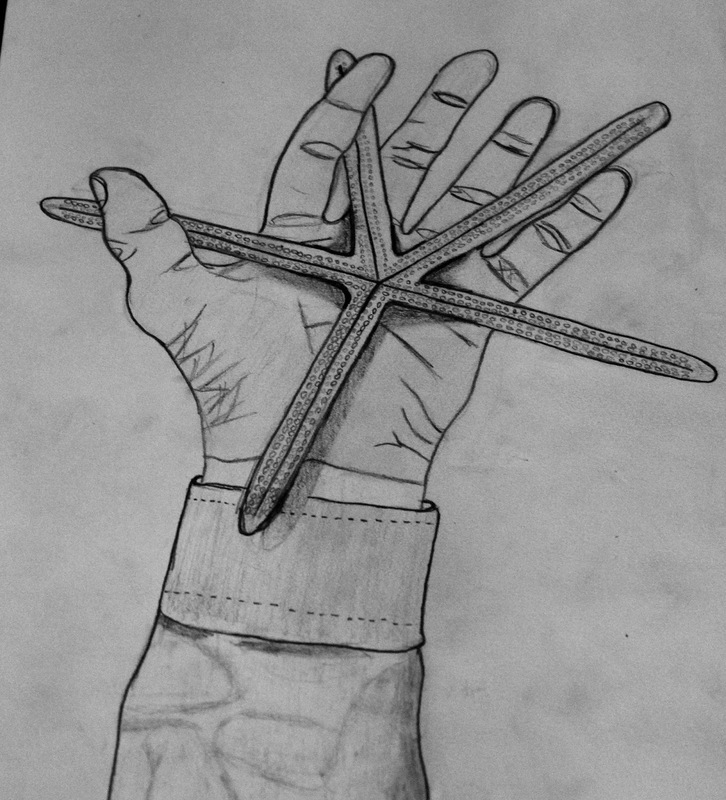 They are charged with drawing a self portrait that through elements such as costume and background reflects a person they admire, and on using their artistry to express emotion and inner life. This year, our school-wide theme is deliberate moral introspection; as the boys determine whom to select for their aspirational portraits, they will need to reflect and consider deeply the qualities that make a person admirable. Preliminary work on our school's exciting expansion and consolidation project is under way. Over the Christmas break, scaffolding was erected around the south and east façades of Graham House, and a sidewalk shed has been built along the North (89th Street) façade. The scaffolding and sidewalk shed will remain in place until the current building, with the exception of the landmarked façade, is demolished during the upcoming summer. The school also plans to finish work on the roof near the front cornice on 89th Street beginning in mid-January. We are keeping members of our community informed about the project's progress along the way via email updates and through the Expansion pages of our website. Stay tuned.